“They took us in trucks. We got in quite innocently and contentedly. But then we heard screams and I ran… The doors were padlocked. They carried me off in a stretcher, tied my feet and cut me,” said Micaela Flores, then a mother of seven from Anta province in the southern region of Cusco. (IPS) – Shelving the case of the forced sterilization of more than 2,000 women in Peru during the Alberto Fujimori regime was a surprise move by the prosecutor in charge. What happened? An IPS investigation found that legal avenues to pursue justice have not been exhausted. On Jan. 24, prosecutor Marco Guzmán announced an end to the investigation of forced sterilizations carried out in Peru between 1996 and 2000. He said he would not pursue criminal charges against Fujimori (1990-2000), three former health ministers and other officials accused of being responsible for the crime. “They took us in trucks. We got in quite innocently and contentedly. But then we heard screams and I ran… The doors were padlocked. They carried me off in a stretcher, tied my feet and cut me,” Micaela Flores, then a mother of seven from Anta province in the southern region of Cusco, told IPS. On that occasion about 30 women went to the health center, duped by a campaign offering general check-ups, she said. Guzmán has decided to prosecute only health personnel in the northern department of Cajamarca. 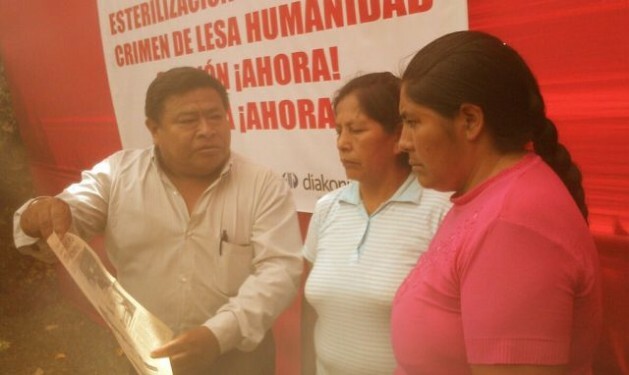 The sterilizations were part of the Voluntary Surgical Contraception Program (AQV – Anticoncepción Quirúrgica Voluntaria), created by Fujimori and his government to bring about a drastic reduction in the birth rate in the poorest parts of the country, especially among rural Quechua-speaking women. Guzmán, as head of the second supra-provincial prosecutor’s office, assumed the case in July 2013 after the investigation was reopened in November 2012. There are currently 142 volumes of evidence in this longstanding case. In May 2009 the prosecution shelved the probe into the former ministers and other officials for the first time, in spite of repeated urging for its completion from the inter-American human rights system. In 2003, the Peruvian state signed a friendly settlement agreement before the Inter-American Commission on Human Rights (IACHR) in the case of Mamérita Mestanza, who died in 1998 as a result of a poorly performed tubal ligation procedure done without her consent. The government promised to pay an indemnity to her family and investigate and bring to trial the government officials who devised and implemented the forced sterilization campaign. After years of delays and foot-dragging, human rights organizations had their hopes raised when Guzmán showed interest in investigating Fujimori’s command responsibility for the generalized, systematic practice of sterilizations. In late November the prosecutor said there were “indications of the alleged participation of Alberto Fujimori in the crimes,” and expanded the investigation into the cases of Mestanza and others. Rossy Salazar, a lawyer with the women’s rights organization DEMUS who is representing the victims, told IPS that this statement by the prosecutor appears on page 60277 of the file as part of a report on the case addressed to Víctor Cubas, the prosecutor who coordinates all human rights cases. In an interview with IPS, Guzmán acknowledged having said “there were indications that Fujimori had participated.” At that point he had interviewed over 500 victims, mainly in the northwestern department of Piura and in Cusco, he said, although in his latest 131-page decision he states he only interviewed around one hundred. Guzmán was also in possession of evidence that the program had targets, incentives, and even sanctions for personnel who did not fulfill sterilization quotas, according to documents obtained by government agencies that investigated the facts of the case. DEMUS invoked these official documents in an appeal against the prosecutor’s decision to shelve the case, which it presented Jan. 28 before the Office of the Public Prosecutor. “In order to examine him I had to interrogate him. I went to interrogate Fujimori and he answered some questions, but not others. For some he invoked the right to silence. Then his defense lawyer gave me a number of documents. This was important because Fujimori had never been questioned about this case before,” he said. Fujimori’s interrogation on Jan. 15 in the Barbadillo prison, where he is serving a 25-year sentence for human rights abuses, lasted less than three hours. One week later, Guzmán closed the case against the ex president. “Was your interview with Fujimori decisive for determining whether he participated in the crimes?” persisted IPS. “It was taken into consideration, but it was not decisive. The decisive thing is the legal package I have to apply… There is no legal support for imputing guilt,” Guzmán said. The prosecutor argued that Peruvian law does not provide for the crime of forced sterilization, and therefore there is no legal support. In his decision he said the victims’ complaints would not be classed as crimes against humanity, which refer to generalized or systematic attacks on a civilian population and have no statute of limitation. In international terms, the Rome Statute, which established the International Criminal Court, does recognize the crime of forced sterilization. The statute entered into force in Peru in July 2002, after the sterilizations were committed and denunciations were initiated, but “the international community has regarded forced sterilization as a crime since the early 1990s,” Salazar said. In its appeal, DEMUS argues that the prosecutor’s decision “should not halt the criminal investigation.” It is “only the first step in the search for truth” and does not end the evidence collection phase. DEMUS asks for a higher level prosecutor to bring charges so that the case can continue. Another means of re-opening the case would be for another victim to bring a new complaint. 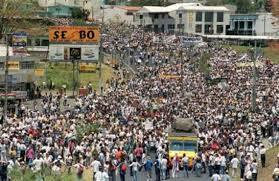 DEMUS also plans to bring the case to the attention of the IACHR in March. “They are isolated cases,” he told IPS. According to the Health ministry, 346,219 sterilizations were performed on females and 24,535 on males between 1993 and 2000, 55.2 percent of them in the period 1996-1997 alone. During that period an average of 262 tubal ligations were carried out a day. More than 2,000 persons were documented to have been deceived or threatened into undergoing sterilization. Women in Cusco were among the worst affected, because on average nearly five operations a day were performed there, according to Health ministry figures and the testimony of victims. Sabina Hillca, from Huayapacha in the Cusco region, told IPS that she set out for the health center in Anta when she was due to give birth to her daughter, Soledad, but the birth happened on the way. The nurses told her she should stay to be “cleansed” and avoid infection. The next day she woke up crying, with sharp pain, an incision close to her navel, and tied to the bed. Afterwards she fled to her village, cleaned the wound with soap and water, removed the stitches as best as she could, and went to her mother for herbal treatments. “Now I have cancer because dry blood collected in my ovaries,” she said, showing the dark scar on her abdomen.